The Xiaomi Mi 5 and LG G5 have plenty of competition as they battle it out for the prize of top smartphone of 2016 so far, but which gadget wins when the pair go head-to-head? Read on for our comparison between the Xiaomi Mi 5 and LG G5. The Xiaomi Mi 5 arrives in the form of three different models, comprised of the Standard Edition, the High Edition and the Special Edition, the last of which is the most premium choice when it comes to specs. Both the Standard Edition and High Edition versions of the Xiaomi Mi 5 look the same, each featuring a vibrant screen with a tiny bezel that almost makes the screen edge-to-edge. A physical home button at the bottom of the front face houses a fingerprint sensor, and the Xiaomi logo is tucked into the top-left corner. According to Hugo Barra, significant efforts were made to ensure the Mi 5's rear camera sits in the same position as it does on Apple's iPhone 6. Xiaomi has crafted a very clean-looking smartphone here, and the curves of the phone's body mean that the Mi 5 feels lovely in the hand. During our hands-on time with the Xiaomi Mi 5, it was easy to spot the similarities between the Samsung Galaxy S7 and the Mi 5's rear panel. Whilst this isn't necessarily a bad thing, the result is a smartphone that's not perfectly unique. Even so, the Xiaomi Mi 5 is delightfully light, weighing in at around 129 g. For context, the Samsung Galaxy S7 weighs 152 g, whilst the LG G5 is a 159 g piece of kit. You could argue that Xiaomi has played it safe with the design of the Mi 5, but even so, it looks good. LG's G5 is clearly recognizable as a member of the G family, but this latest model brings plenty of its own ideas to the table when it comes to design. The LG G5's metal unibody design looks gorgeous in the light and the new rear texture feels more premium than the leather back on the LG G4 ever did. It's possible to remove a section of the base of the LG G5 to reveal the Magic Slot, a proprietary connector that allows you to hook up VR headsets, cameras, speakers and more. This is certainly one of the more interesting parts of the LG G5's design. Whilst the LG G4 arrived with an interesting rear panel with a volume rocker and power button, things are a little different this time around. The LG G5 instead features a fingerprint scanner on its back, while the volume controls have moved to the side of the handset. All three versions of the new Xiaomi Mi 5 come with a 5.15-inch screen with Full HD resolution, and judging by our own experiences with the smartphone there's no blemishes to be seen anywhere on the display. A pixel resolution of 1,920 x 1,080 is on offer at 427 ppi, and colors pop nicely on the new gadget's display. As mentioned previously, the Xiaomi Mi 5's display comes very close to the edges of the handset's body. Whilst it's an eye-pleasing feature, grasping the phone tightly sometimes means the edges are obscured by your palm. We'll be putting the Xiaomi Mi 5's display through its paces in our upcoming review of the smartphone, so stay tuned. On the other side of the fence, the LG G5 comes with a 5.3-inch LED IPS screen, which means it's slightly smaller than that featured on the LG G4, which came in at around 5.5-inches. Users are treated to a QHD resolution (2,560 x 1,440) which means crystal-clear visuals. Despite the slight reduction in screen size, the front of the LG G5 is complimented by an Always On display, which is primarily used to show notifications, dates and times without soaking up too much battery life. A front-facing camera, flash and speaker live at the top of the phone. Our playtime with the LG G5 at MWC taught us that the viewing angles on show here are excellent, so that's another tick for LG's release. Each of Xiaomi's three Mi 5 builds are equipped with Qualcomm's Snapdragon 820 chipset, although the Standard Edition of the handset is tuned to a different clock rate. The most affordable version of the Xiaomi Mi 5 comes with 32 GB of internal storage and a clock speed of 1.8 Ghz, whilst the middle model and pro build instead star 2.15 GHz. The middle model, also known as the High Edition, comes with 64 GB of internal storage. Both the Standard Edition and High Edition Xiaomi Mi 5 are backed by 3 GB of RAM. 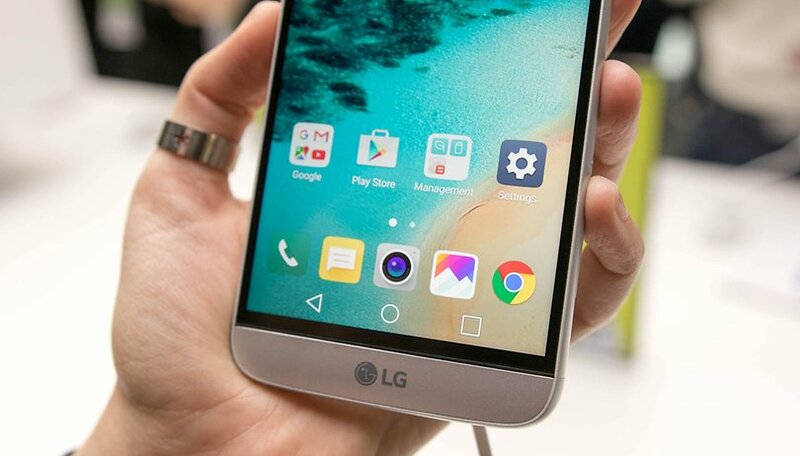 The LG G5 is powered by the Snapdragon 820 octa-core processor with 4 GB of RAM that results in a nippy user experience. Even though the LG G4's Snapdragon 808 chip coped well under pressure, there's a noticeable improvement in performance in the LG G5. Full microSD card support is thrown into the experience and the LG G5 has 32 GB of storage to play around with out of the box. The main snapper featured on all three Xiaomi Mi 5 models is a Sony-designed 16 MP IMX298 camera, which runs alongside impressive 4-axis OIS technology. Xiaomi's advanced OIS functionality equals sharper images all round, which is good news. Meanwhile, the front of the Xiaomi Mi 5 is rocking a 4 MP camera with an f / 2.0 aperture lens, capable of wide-angle selfies. The LG G5's dual camera setup on its rear is one of the headline features of the handset, and a 16 MP main camera and 8 MP wide-angle camera are included. LG's camera on the G4 was a top performer and manual mode offered plenty of features for photography fanatics to get stuck into. The LG G5 again retains the granular manual mode, but picture quality is superior to its predecessor. It's possible to save snaps in RAW format and those confident with camera tech can play around with ISO settings and such. The LG G5's front-facing camera is an 8-megapixel offering, which should do more than enough to keep selfie addicts happy. Xiaomi's Mi 5 runs on Android Marshmallow backed by MIUI, and when it comes to customization the UI really delivers. Perhaps an even bigger strength of the skin is the regularity of updates, which keeps things running smoothly. Interestingly, any apps downloaded through MIUI head straight to the home screen, as there's no app drawer in sight. Apps can be grouped into folders, however, much like on an iOS device. The LG G5 runs on Android Marshmallow integrated with LG's own UX 5.0. Arguably the most noticeable difference between UX 5.0 and previous builds is the removal of the app drawer. On top of that, dual-window mode is no longer present. The Xiaomi Mi 5's battery is a 3,000 mAh ingredient, which should prove effective when helped along by Marshmallow's own Doze feature and the strengths of the Snapdragon 820 chip. Quick Charge 3.0 is fully supported, which apparently boasts 20 percent faster charging speeds than the previous build of Quick Charge. The result is an 80-90 percent battery charge in an hour. As mentioned previously, the clever design of the LG G5 results in the option to slide the battery out of the bottom of the device using a removable cap. The LG G5 is kept alive thanks to a removable 2,800 mAh battery, and LG's Always On display should take steps to keep it chugging along for a good amount of time. We'll be conducting some detailed tests on the LG G5's battery in our full review. Want a closer look at the differences between the Xiaomi Mi 5 and LG G5? Take a look at our specs chart below for an overview. Whilst the Xiaomi Mi 5 takes some design inspiration from the same flagship devices it's competing against, the handset brings its own unique strengths to the fight. There's a choice of different models to choose from, a light frame to enjoy and a pretty, almost bezel-less display. Of course, the LG G5 is a fierce opponent, and the headline-grabbing dual camera setup will have photography fans very excited. A removable battery in the form of LG's Magic Slot is an intriguing addition, too. Which smartphone are you siding with in this Xiaomi Mi 5 vs LG G5 comparison? Let us know your thoughts in the comments section below. Will it be possible to buy this phone in the US? I would like to suggest one correction to this article. The high end model of Xiaomi mi5 has 4GBs of RAM instead of GBs. Everything is great about Xiaomi. Agree with all but what's about after sales service? Stop spending so much time on xiaomi. You even can't buy it in EU en US unless high importtaxes. And what about warranty? Not all of the APit readers are from Us or the Europe. So it does make sense for them to report on the flagship phone that is priced below mid range offerings from Samsung Lg or HTC whilst performing at the same level or better than most flagships. Is google play pre installed on the mi5? Provided that you buy from a seller who flahes it with an international ROM. Another thing to do is to get from other global markets like India or Singapore when it releases. hey guys! why are you not comparing THE PRICE ,it really makes difference when Mi 5 is almost half the price of other flagships. YES! EXACTLY! THANK YOU PEOPLE. Do some research, guys. Thank you Anurag! Someone has to keep reminding these folks. haha yeah.. xiaomi has to get credit for the design.. why samsung is being marketed as the first ones... xiaomi all the way... it is turning out to be a great brand it needs credit... and we all have to correct these guys.. Almost done! Check your email to confirm your subscription. I am able to revoke my consent to the use of my e-mail address at any time with immediate effect by clicking on the "Unsubscribe now" link at the end of the newsletter or by changing the newsletter settings in my Profile under "Email Notifications and Newsletter".